� Sweat advanced to her first main draw in what was her 10th tournament on the AVP Tour. She chalked up her first career main draw match win in the 2009 Manhattan Beach Open. � In July 2009, Sweat and Tealle Hunkus were named to the USA Volleyball Under-26 beach volleyball national team. � In 2013 Sweat was eliminated from an FIVB event five times by another American team. 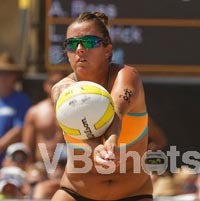 � Sweat notched her first AVP win in 2013 in Huntington Beach with Lauren Fendrick. The duo lost their first round match, then won six straight matches, including five against teams seeded 10 or higher and one in the rematch against the team which defeated them in the first round. � In 2014 Sweat and Lauren Fendirck lost seven matches during the AVP season, with six of those to top-ranked April Ross and Kerri Walsh Jennings, who knocked them out of all six tournaments Sweat and Fendrick played. 2014: Sweat formed a partnership with Lauren Fendrick, and they finished second five times in the six AVP events together. Sweat ended the year third in digs per game (6.07) and 10th in aces (.67 per game). Internationally Sweat and Fendrick had a pair of fifth place finishes in their eight events. They upset five teams seeded fifth or better during the FIVB season. 2013: Sweat and Fopma were the second-ranked team on tour after advancing to four semifinals in seven events. The duo fared especially well in the California events, placing second in Manhattan Beach and Santa Barbara before winning the season finale in Huntington Beach. Sweat led the Tour in digs (7.26 per game). Sweat and Fopma played 10 tournaments on the FIVB Tour, and advanced from the qualifier in four of five tries. Their best finish was a bronze medal, Sweat's first on the FIVB, and they placed 17th in the World Championships in Poland. Sweat played the FIVB season finale with Jennifer Kessy, placing 17th. 2012: Sweat formed a partnership with Jennifer Fopma, starting the year with a win in a USA Volleyball IDQ event. The duo had a pair of thirds in the two AVP events, while on the Cuervo Tour they had one win, two seconds and three thirds. Internationally they played in two FIVB tournaments with a best of 25th, and garnered a seventh in an FIVB Challenger as well. 2011: Sweat and Batt began the year with a win in a NORCECA tournament. On four different domestic tours, the pair won once in five semifinal appearances. 2010: Sweat continued to play with Batt, and the duo won an AVP Young Guns tournament. In seven AVP events they had three top-10 finishes. Sweat and Batt advanced from all three qualifiers they played in, getting two of their best finishes, a seventh and ninth, after doing so. 2009: Began playing with Morgan Flarity, and in her second event of the year, advanced to her first career main draw in Riverside. In six events with Flarity, the pair advanced to three main draws, including in Manhattan Beach. Sweat played a pair of events alongside Kristen Batt after the duo won an AVP Young Guns event, advancing to the main draw in their last event in Chicago. Sweat and Tealle Hunkus represented the U.S. in an FIVB event in Finland in August to end the year. 2008: Played in six qualifiers, the first four with Hartley and the last two with Cindy Phillips. 2007: Made her pro beach volleyball debut with a pair of qualifier events in Miami and Tampa, playing both with Kristy Hartley. College: Sweat played on the inaugural team at Florida Gulf Coast University, leaving as the team's career leader in kills. She tallied over 1,000 kills and digs in her four years. The school was Division II her first three seasons and became a Division I school her senior year. As a junior, Sweat was named the AVCA South Region player of the year. She was selected as an Atlantic Sun Conference second-team player her senior season. Personal: Formerly Brooke Youngquist, she married fellow AVP player Nicholas Sweat. She has a younger sister, Holly, who played both indoor and sand volleyball at Florida Gulf Coast, and two brothers (Harvey and Brett). 2014: Sweat moved to California in 2012 to focus on beach volleyball.